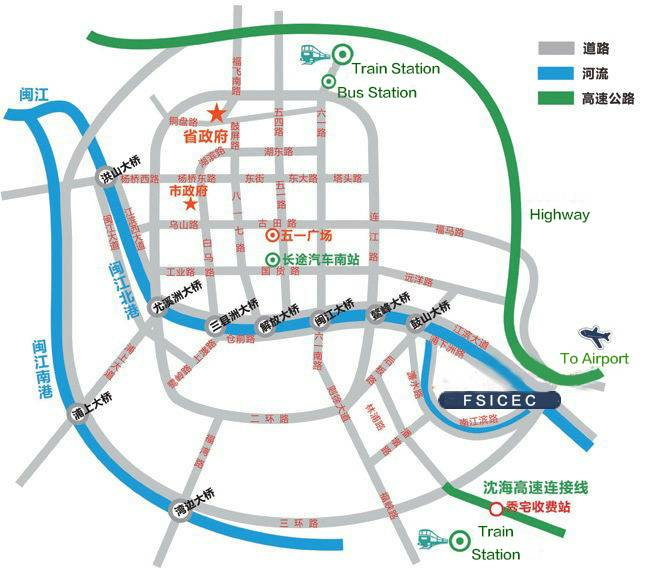 FSICEC is located in the exhibition island, Cangshan District, Fuzhou City, with convenient traffic around: South Jiangbin Road, Gushan Bridge, Kuiqi Bridge, Xiazhou Road, Linpu Road, Fuxia Road, and other highway connect different parts of the exhibition island together. There is also well-developed traffic on the exhibition island, surrounding with two bus terminals in east and west side. There are 8 bus lines. There will be more shuttle buses lines when there are big exhibitions. In addition, Metro Line 6, connecting FSICEC and Fuzhou Changle International Airport, is under design and construction.